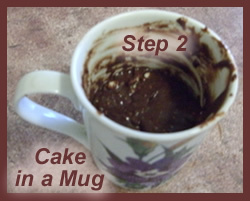 A cake in a mug is exactly as it sounds - a cake that is mixed, baked and eaten, all in a coffee mug. Surprising, I know! 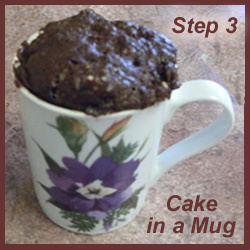 I was thrilled to discover (thanks to one of our faithful readers) this delicious recipe for a chocolate mug cake. It couldn't be simpler to throw together in just a matter of minutes. This is the perfect treat for unexpected arrivals, or pampering indulgence for yourself when you just a want enough for one or two. All it involves is combining the ingredients for a mini chocolate cake in a mug, microwave it for 3 minutes, and the deed is done. Of course, YOUR cake doesn't have to be chocolate, but you know I'm a chocolate fiend, so I just can't resist. 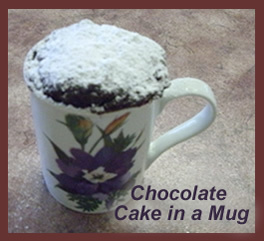 I made a chocolate mug cake today, but I look forward to trying other variations in the coming weeks and months. I hope you will experiment, too, and tell us what delicious recipes you come up with for a cake in a mug. I have been thinking about lemon, coffee, blueberry, caramel, pumpkin, and even zucchini cake. Don't they all sound just too tempting? Let's start with the chocolate version of the mug cake, shall we? I'll list the recommended ingredients along with my own variations/substitutions. I know it looks like a lot of ingredients, but really you probably have all of them (except perhaps the chocolate chips/pieces) already in your pantry, so it only takes a minute to grab them in spoon them into a coffee mug. In fact, it's as easy as 1, 2, 3! 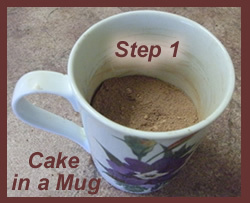 Measure the dry ingredients into the mug and give it a quick stir with a fork. Microwave on medium for about 3 minutes. That's it! It may look like the cake is going to go pouring over the top while it's cooking, but it really shouldn't "spill." The cake will just puff up, and actually I think that looks rather nice when you're all finished. If for some reason you find that yours really does spill over and run down the side of your mug, you may need to use a larger mug next time around. I wanted to give mine a "prettier" finish, so I also got some icing sugar (powdered sugar) and sprinkled it generously over the top. Looked much more appealing and attractive in the end. You can eat the cake right from the mug, of course. Whipped cream on top would be delicious, too. However, after I took these photos, I decided to try taking it out of the mug to see how it would look served on a plate. It wasn't too bad, really, but not exactly photo worthy. :) BUT, I did make one discovery. There was enough cake in that mug for two! So, it would be quite easy to create something like this as a dessert if there are only two people present. This would be a great choice for my hubby and I on special occasions because I won't be stuck with a large cake (leftovers) that I will be compelled to eat over the following days (wouldn't want good chocolate cake to go to waste/waist, now would I!?). Have A Coffee Mug Recipe To Share? Coffee mug recipes are quick, easy, and delicious, not to mention fun! Have you experimented and come up with a delicious mug cake or brownie recipe? Please add it to our growing list along with photos if you've got them! Do you have any pictures of your coffee mug dessert idea to add? Great! Click the button and find it on your computer. Then select it.